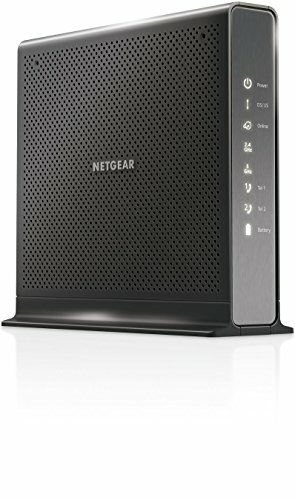 The NETGEAR C7100V is DOCSIS 3.0 three-in-one high-speed cable modem + AC1900 Wi-Fi router + XFINITY Voice. This cable modem router gives you high-speed Internet connection with combined speeds of up to 1.9Gbps with AC19000 Wi-Fi. Supports two XFINITY Voice telephone lines with battery backup. Enhanced features include 3-way conference calling, caller ID, call forwarding and more. Save up to 120 a year* by eliminating Internet service provider rental fees. Ideal for XFINITY Internet and Voice service.